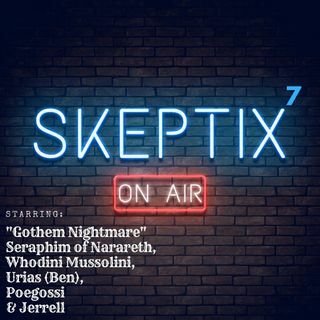 Conversation about the Mystery School, questions about is there a God, Ascended Masters & Reptilians living among-st us..
Skeptix is a brand new segment presented by the Only One Media Group through the already famous, Vigilantes Radio. Skeptix, is a show about people exploring the thoughts & religious beliefs of artists, celebs & all sorts of people. We just may debate, debunk, we may disagree greatly, we may share similar beliefs but overall we want to allow our guest an ... Maggiori informazioni opportunity to express themselves freely. Tonight's episode features rock-star legend, "Gothem Nightmare" Seraphim of Nazareth, we'll talk about Elite Conjurers, the Supernatural & why the Catholics are the leading cause of Atheism altogether & oh boy...don't want to give it all away here! Set your reminders, it's happening! 06/14/2018 | @10PM CDT | 701-801-9813 or hop in the mix via www.onlyonemediagroup.com/skeptix and slap that "Go LIVE!" button.